Seasonal Affective Disorder is much more than just the winter blues. SAD is associated with three brain conditions: reduced serotonin, over-production of melatonin, and deficiency in vitamin D.
Frank*, 55, has been living with bipolar disorder since he was 18. Over the decades he’s noticed that his condition is the most difficult to manage when fall gives way to winter. “As soon as it starts getting dark I feel it coming,” he said of his depressive symptoms. Erin, 57, is normally very active and productive, but as soon as the days become shorter she feels her mood slipping. Frank and Erin both say they suffer from seasonal affective disorder (SAD), a type of depression that is linked to the change of seasons. Most often, seasonal affective disorder symptoms — which include typical depression symptoms like hopelessness, lack of energy or weight gain — strike during the winter months when short days and cold weather can leave even the healthiest people feeling a bit down. Up to 6 percent of Americans experience depression during the winter, with as many as 20 percent experiencing a more mild form of SAD, according to The American Academy of Family Physicians. Luckily, the treatment for seasonal affective disorder is minimally invasive and can be very helpful for restoring optimal mental health during the winter months. 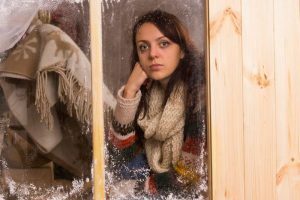 Although many people joke that they feel like hibernating during the winter, people who actually have seasonal affective disorder experience depressive symptoms that are severe enough to interfere with day-to-day life, just like the symptoms experienced by people with major depression. Although all depression is cyclical, with periods where symptoms become better and worse, people with SAD find that their symptoms predictably flare up during the fall or winter and they experience remission during the spring and summer (although a rarer form of SAD can follow an opposite pattern, with flare-ups during the warmer months). In order to be diagnosed with SAD, a person must have this pattern for two years in a row. As with depression, SAD is diagnosed more often in men than women. And it is more common in areas that have darker, colder winters. “The incidence of this condition absolutely goes up further from the equator,” Gandotra said. Doctors don’t fully understand why SAD occurs, but they are learning more about seasonal affective disorder symptoms and factors that can contribute to seasonal depression. SAD is associated with three brain changes. People with the condition usually have lower levels of serotonin, the neurotransmitter that helps regulate mood, energy, sleep and digestion. Because these individuals have less serotonin, their brains are less effective at managing their mood, energy and sleep patterns. In addition, many people with SAD over-produce melatonin, a chemical that encourages sleep. This can make them feel more fatigued and disrupt their circadian rhythms. Finally, many people with seasonal affective disorder are deficient in vitamin D, which effects mood and energy and helps facilitate melatonin production. Because this vitamin is absorbed from sunlight, the short winter days can compound deficiency. Doctors also believe there is a genetic component to SAD. Many people with SAD also struggle with substance issues, especially unhealthy drinking patterns. Gandotra said that the science in this area is speculative, but suggests that people who are depressed have higher levels of cortisol, the stress hormone. “That is a significant trigger for co-occurring substance use disorder,” he said. People may try to self-medicate with alcohol when they are stressed. In addition, SAD symptoms often peak during a time of year that is already stressful. “Seasonal affective disorder often impacts people during the holiday season in the U.S., a time which is often filled with increased family expectations, financial stressors and a corresponding increase in depression and substance abuse,” Gasior said. As with any co-occurring mental health condition and substance misuse, it’s wise to treat SAD and the substance use disorder at the same time, Gandotra said. “When one gets worse, the other gets worse; when one gets treated, the other gets better, too,” he said. Treating seasonal affective disorder starts with low-level interventions that are often very effective in improving mood. One of the most well-known treatments for SAD is light therapy. Patients who do light therapy spend time in front of a special lamp that puts off at least 10,000 lux. This can be done while working or watching television, but Burns said that this therapy is most effective during the early part of the day. Gandotra recommends another morning intervention — dawn stimulation. Many people have to rise before the sun in the winter, so getting a light that is timed to gradually brighten the room before you wake — mimicking sunrise — can help regulate your body’s internal clock. Getting more Vitamin D can also help alleviate symptoms of SAD. One way to do this is by spending more time in the sun. But that can be tough for people in cold, dark climates, so taking a Vitamin D supplement is an effective option. The dosage needed can vary widely, so make sure to speak with your doctor to determine the right dose for you. Other treatments for depression — including exercise, mindfulness and psychotherapy — are also used to treat SAD. If these non-invasive options aren’t effective, doctors recommend an antidepressant medication, usually an SSRI like Zoloft or Prozac. These are usually prescribed year-round, although the dosage may be reduced or increased depending on the season. No matter what, people who have symptoms of seasonal affective disorder should not hesitate to reach out to their healthcare providers. Have some advice for treating seasonal depression? Please share your tips in the comments.